At the statewide scheduling meeting two years ago, Derby and Mill Valley were the lone 5A and 6A schools open in Week 3. Mill Valley coach Joel Applebee looked at his first cousin, Derby coach Brandon Clark. “Are you kidding me?” Applebee said. The two teams looked around but couldn’t find anyone to fill the date. The squads didn’t want a bye and decided to play each other for 2014-15. Applebee was a former assistant for Clark at Derby before he took the Jaguar head coaching position six years ago. The two grew up together and the squads attend multiple summer camps together, including Arkansas, Tulsa and Derby. Their junior high teams even match up. “Probably my best friend,” Clark said. Mill Valley stands No. 1 in Class 5A for the second straight week, while Derby is ranked No. 3 in Class 6A. Last season, the Panthers pulled away for a 35-14 home victory. This time, Derby travels east, easily the longest road trip in the 10-year Clark tenure. “Really gauge where we are at,” Clark said. Ultimately, the game will come down to the teams, each one featuring a standout quarterback, an all-state utility player and strong supporting casts. Mill Valley has just one home regular loss since the start of the 2012 season. The Jaguars are in the second of four straight home games, an unusual scheduling quirk. “It’s not about us, it’s about the kids,” Applebee said. Mill Valley features senior signal caller Logan Koch (391 pass, 230 rush) and senior wide receiver/returner Christian Jegen (282 all-purpose) for a program that is top-ranked in a classification for the first time in school history. Applebee has told his team to embrace the ranking and then focus on each day’s efforts. “They have worked extremely hard to get to this point,” Applebee said. Last Friday, 6-foot-7 tight end Lucas Krull had a standout contest. He collected three catches for 52 yards and a touchdown in a key season-opening 38-20 victory versus St. Thomas Aquinas. Last week, in a 40-6 win versus Blue Valley Northwest, Krull collected seven catches for 119 yards and two scores. “Lot of different weapons in the passing game,” Applebee said. Applebee has the most depth of any team in his tenure. He has played 16 to 17 players significant snaps on defense, which has allowed Mill Valley to keep players fresh. Senior middle linebacker Sean Burnett leads the team with 17 tackles, while senior outside linebacker Cole Morris paces the squad with five TFLs and two sacks. Junior safety Joel Donn is second with 15 stops. “Bought well into playing together,” Applebee said. Derby has senior quarterback Brady Rust (301 rushing, 301 passing yards) and junior all-purpose threat Kai Lemons (148 receiving). Senior running back Garrett Xanders has collected 187 rushing yards. 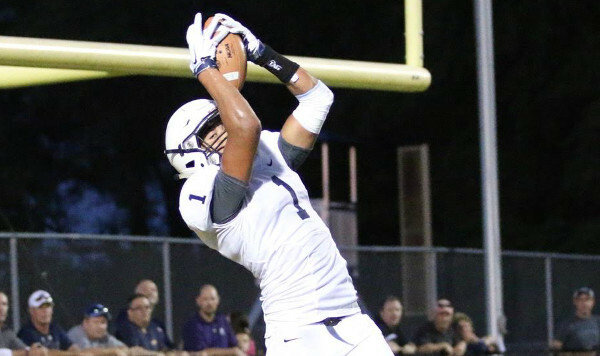 The Panthers pulled away from Maize in the second half en route to a 42-20 victory. Last week, Derby defeated Salina Central, 54-20. “Our kids came out really hard in the first half,” Clark said.